Cancer does not discriminate: Kikkan Randall is a case in point. Last February, she made history at the Winter Olympics with her teammate Jessie Diggins in their dramatic women’s team sprint win in cross country skiing. It was the first Olympic gold medal ever won by U.S. athletes in a cross-country skiing event. A bit more than three months later, she was diagnosed with Stage 2 breast cancer. Her story, which is ongoing as we post this, is one of tenacity, gratitude and incredible light, even through the dusky moments. 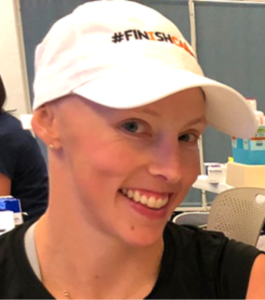 It is a determination to fight the disease on her own terms, with exercise, nutrition and a loving community of like-minded supporters as the pillars of her fight. Excerpt: “On May 31, 2018 just over 3 months after achieving my lifelong goal of winning an Olympic gold medal I was diagnosed with Stage 2 breast cancer. To say that it rocked my world is an understatement. I went through all the phases. At first I experienced disbelief. Like, ‘No. This can’t be right. Not me. I can’t have this. I then shifted to anger and frustration, like, ‘This isn’t fair I have done everything right. This can’t be happening to me.’ It went against everything I believed to be true. Her video log of her days in treatment are a guiding beacon. To see it and learn more about Kikkan, click here.